The problem is that a lot of people don’t want to focus on believing in themselves or they are having a hard time believing in themselves. They could truly believe in themselves if they really try. 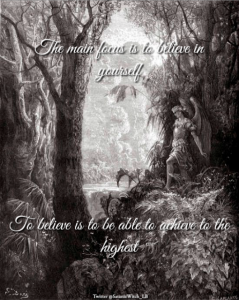 If they want to achieve something to the highest then they will have to work on focusing on believing in themselves. In witchcraft the main part of getting your rituals and spells to work is to believe that it will work. If you don’t believe that they will work then nothing will happen. 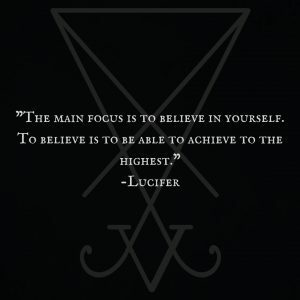 If you really want your rituals and spells to work then you must start focusing on believing that it will work. Witchcraft can be very powerful but it is YOU doing the magick and performing the rituals and spells. Those who have said that Lucifer didn’t come to help them or guide them, they did not believe enough in him to let him help them. If you don’t believe enough in him enough you will have a hard time contacting him. If you let yourself believe and let yourself become more open then good things will happen. Open yourself spiritually. Let him guide you and he will help you reach to top. The Marking of 5 Years with Lucifer! Can Lucifer hear our thoughts? Previous story Calling Lucifer the “Dark Lord”?